The most amazing thing about Indian elections is the magnitude of the voters involved. BJP the party that won the election polled 17 crore votes which is equal to the total population Of Nigeria (the 7th most populous country). Congress got nearly 11 crore votes which is almost equal to the total population of Mexico (the 11th most populous country). BJP won the 2014 election and got a majority on its own (282 seats). it came to power with only 31% share of the popular vote. Infact it is the lowest vote share for a single party since 1967 where congress party won 283 out of 520 seats with 40.8% of the votes. Indian polity is heavily fractured. It is precisely because the vote is so fragmented that the BJP was able to win 282 seats with just 31% of the votes. Congress got 19.3% vote share (which incidentally is higher than the BJP's 18.5% in 2009) unfortunately for the Congress, its 19.3% votes only translated into 44 seats while BJP's 18.5% had fetched it 116 seats in 2009. In terms of vote share, BJP is on the top with 31 per cent, followed by 19.3 per cent for Congress. Only seven parties have managed to get more than 3 per cent vote share and include BSP, Trinamool Congress, SP, ADMK and CPM. Those having lesser vote share than 3 per cent of independents include TDP (2.5 per cent), YSR Congress (2.5 per cent), AAP (2 per cent), Shiv Sena (1.9 per cent), DMK (1.7 per cent), BJD (1.7 per cent), NCP (1.6 per cent), RJD (1.3 per cent) and TRS (1.2 per cent). These 7 states amount for slightly more than 50% of Lok Sabha seats at 276 (total 543 seats). BJP clinically targeted these states and walked away with 211 seats by itself and with Siva Sena it got 229. Remarkable as in as many as 4 states U.P, Maharashtra, Karnataka it was not in power. Its image was not very favorable in Karnataka (it was riddled with corruption charges when it was in power the last time it ruled the state). 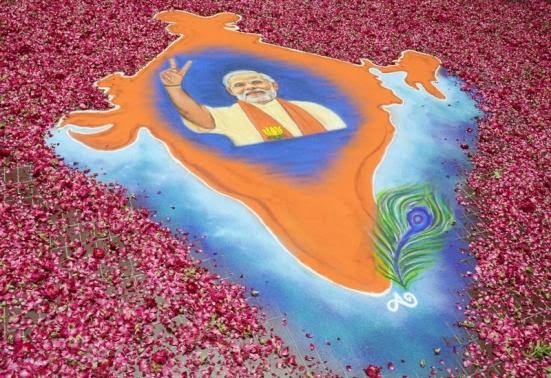 Modi’s concentration was also on another 7 states where it could do well, Assam, Haryana, Jharkhand, Uttarakand, Himachal Pradesh, Chhattisgarh and Delhi. These send 65 members to the lower house and BJP got 52 out of 65 seats a whopping 80%. Combined BJP walked away with 211+52 = 263 (10 shy of the magic figure) seats by concentrating on 14 out of 28 states. The above 14 states add upto 341 seats (63% of all seats) and BJP won 263 out of these (77%). This was where BJP won the election and Congress lost. Very smart work.